Going to Havana? Nah nah nah, Havana's coming here with Asere! 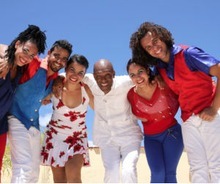 Musicians and Dancers of the Havana Cuba All-Stars. Part of Hammer Theatre's ongoing Music Without Borders series, the band and dancers come to town on their Asere!-roughly translated: "dude" or "friend"--tour. Join the son cubano 12-piece banda and six of Cuba's most talented dancers. The group blends the richness of Cuba's musical tradition with the fresh sounds of the contemporary Cuban music scene, immersing audiences in the sights and sounds of rumba, cha cha, salsa and more.